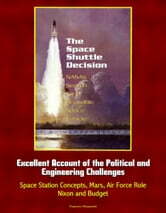 Professionally converted for accurate flowing-text e-book format reproduction, this NASA report presents a fascinating history of the decision to proceed with the Space Shuttle program. Contents: Chapter 1 - Space Stations and Winged Rockets * The Collier&apos;s Series * Background to the Space Station * Winged Rockets: The Work of Eugen Sanger * The Navaho and the Main Line of American Liquid Rocketry * The X-15: An Airplane for Hypersonic Research * Lifting Bodies: Wingless Winged Rockets * Solid-Propellant Rockets: Inexpensive Boosters * Dyna-Soar: A Failure in Evolution * Chapter 2 - NASA&apos;s Uncertain Future * Technology Bypasses the Space Station * Apollo Applications: Prelude to a Space Station * Space Station Concepts of the 1960s * Early Studies of Low-Cost Reusable Space Flight * Two Leaders Emerge: Max Hunter and George Mueller * NASA and the Post-Apollo Future . * Chapter 3 - Mars and Other Dream Worlds * Nuclear Rocket Engines * A New Administrator: Thomas Paine * Space Shuttle Studies Continue * Space Shuttle Policy: Opening Gambits * Paine Seeks a Space Station * Space Shuttles Receive New Attention * Space Task Group Members Prepare Plans * Agnew Leads a Push Toward Mars * Chapter 4 - Winter of Discontent * The Sixties * Mars: The Advance * Mars: The Retreat * The Turn of Congress * Paine Leaves NASA * Chapter 5 - Shuttle to the Forefront * The Air Force in Space * The Air Force and NASA * A New Shuttle Configuration * Station Fades; Shuttle Advances * The Space Shuttle Main Engine * Chapter 6 - Economics and the Shuttle * Why People Believed in Low-Cost Space Flight * The Shuttle Faces Questions * Change at NASA and the Bureau of the Budget * The Fall of the Two-Stage Fully-Reusable Shuttle * Chapter 7 - Aerospace Recession * The Boeing 747 * The Supersonic Transport (SST) * The Lockheed L-1011 * Aftermaths * Chapter 8 - A Shuttle to Fit the Budget * The Orbiter: Convergence to a Good Solution * The Booster: Confusion and Doubt * End Game in the Shuttle Debate * TAOS: A New Alternative * A Time to Decide * Chapter 9 - Nixon&apos;s Decision * Nixon and Technology * Space Shuttle: The Last Moves * The Hinge of Decision * Loose Ends I: A Final Configuration * Loose Ends II: NERVA and Cape Canaveral * Awarding the Contracts. The Space Shuttle took shape and won support, and criticism, as part of NASA&apos;s search for a post-Apollo future. As with the Army and Navy in World War II, NASA had grown rapidly during the 1960s. Similarly, just as those military services saw a sharp falloff in funding in the wake of victory, the success of the piloted Moon landings brought insistent demands that NASA should shrink considerably. In facing those demands, and in overcoming them to a degree, NASA established itself as a permanent player in Washington. Soon after Neil Armstrong made his one small step in the lunar Sea of Tranquility, Paine received a cold bath in the Sea of Reality. Nixon&apos;s budget director, Robert Mayo, chopped a billion dollars from Paine&apos;s request. This brought an end to NASA&apos;s hopes for a space base and for flight to Mars. It appeared possible, however, to proceed with the space station and the shuttle, as a joint project. The shuttle drew particular interest within the Air Force, which saw it as a means to accomplish low-cost launches of reconnaissance satellites and other military spacecraft.